DAVID: Not sure anything can stop Chivo Lubezki from going an unprecedented three-straight — not Roger “13 nominations, zero wins” Deakins for Sicario, not Robert Richardson’s sumptuous 70mm work on Hateful Eight, not John Seale’s efforts on Mad Max. Lubezki is the reigning emperor of cinematography, and we must all pay homage to what he pulled off with The Revenant: elaborately choreographed long takes, with all natural light, in an unforgiving environment. I’ll make fun of Leo and roll my eyes at Iñárritu, but Lubezki gets only my respect. CHASE: Considering I spent about half of my The Revenant review drooling over Lubezki’s work, I can’t possibly pick anyone else. He is a god among men. This is a super stacked category, though. Someone who’s missing is Cary Joji Fukunaga, whose work on Beasts of No Nation is the equal of the other films on this list. Still, Lubezki, Lubezki, Lubezki. SEAN: Yes, Lubezki’s work in The Revenant is as astonishing as anything else he’s done. But I’m so incredibly sick of the film’s “it was so hard to make” argument. You know what, so was Mad Max and you don’t hear them bitching about it on the awards circuit. Nothing was as mesmerizing or jaw-dropping as John Seale’s lensing of that post-apocalyptic vision of wasteland hell. There are just too many shots where you ask yourself “how the hell did he do that?” not to consider it the best cinematography of the year. I’m hoping for a well deserved upset. Chivo has had two in a row. Let’s let someone else get the honor, shall we? DAVID: The only question here is whether Sandy Powell’s work on Carol and Cinderella (very different, both excellent) will split voters enough for Jenny Beavan and Mad Max to take the prize. It’s possible — even likely — that things will coalesce behind Carol and its fabulous sweaters, but only one of these films is going to be fueling trick-or-treaters and conventioneers for decades to come, and that’s Fury Road. CHASE: Fury Road is going to win a slew of smaller awards, but I don’t think this is one of them. This is a chance for Carol to win its only award of the night. Those sweaters are fabulous. SEAN: It’s strange to think that Fury Road is the front-runner here because this kind of work normally doesn’t get recognition from the Academy. If Fury Road sweeps the crafts awards like I think it will, it could end up being the most awarded film of the night even if it misses the big two. DAVID: This is one of those bellwether categories — a surprise win for Revenant, Spotlight, or (especially) The Big Short would portend big things later on for those films’ chances. But I’m not counting on it: Mad Max: Fury Road should continue its romp through the technical cats, and no win would be more deserved than Margaret Sixel’s; having never edited an action film before, she pushed the boundaries of what was possible and gave us a brand-new grammar, all while maintaining clear geography and propulsive energy. Also, she’s George Miller’s wife, and to see them both win would be ADORABLE. CHASE: I usually just go with the Eddie Award winner here, and that means Fury Road. The editing is a huge part of what keeps that film fresh through 90+ minutes of car chases, and I’d be happy to see it win. SEAN: This should be no contest. Fury Road all the way. But watch out for The Big Short, whose frantic approach managed to dupe more than a few viewers into thinking they were watching something special. Funny how a year ago Thelma Schoonmaker couldn’t get in for similar, yet much looser, more visceral, and more inspired work. DAVID: This category is always a little bit weird (how many of you have even heard of that middle nominee? ), but there should be no doubt about the winner: Fury Road. Again. CHASE: Wait, is that a Bad Grandpa sequel I didn’t know about? Doesn’t matter. Put me down for Fury Road. SEAN: Fury Road‘s make-up is instantly iconic. If The Passion of the Christ couldn’t win for its masochistic work, then The Revenant shouldn’t either. DAVID: This is the only category where I’m disappointed NOT to see The Revenant, and its absence makes a weak year for Score even weaker. Even John Williams, the GOAT, turned in his — let’s be honest — fifth or sixth-best Star Wars score and got rubber-stamped. And because he was working on that, he didn’t do Bridge of Spies for Spielberg (scandal! ), so Thomas Newman is here instead for his unmemorable efforts. I dug Jóhann Jóhannsson’s Sicario score, but it’s too idiosyncratic to win, and Carol might be getting shut out entirely — so that leaves Ennio Morricone, a legend in his own right, to take the stage for basically just the overture to The Hateful Eight. I had really high expectations for that score, and it didn’t meet them, but Morricone will win anyway and I guess that’s fine. CHASE: Story, story, story. How can Oscar resist the chance to award the man who has created some of the greatest film scores in history, but has never won? Despite Tarantino’s drunken efforts to ruin things at the Globes, Morricone is going to win for The Hateful Eight. That said, for all the undeserved awards The Revenant is going to win, this is one that it should, but Sakamoto was unjustly snubbed. SEAN: I wish there was more of Morricone’s score in The Hateful Eight, but what is there is stellar and memorable work. A career achievement award no doubt, but a worthy one at that. DAVID: This category is a disaster (it always is), but all I’ll say is that if Sam Smith wins for his stupid, terrible, tuneless, deathly boring James Bond theme, I’m going to scream. Get ready to start calling Lady Gaga “Oscar Winner Lady Gaga” for her contribution to documentary The Hunting Ground, because she hasn’t had a bizarre enough year. But the bigger story should be co-writer Diane Warren, predicted to get her first Oscar in eight tries. CHASE: Lady Gaga’s win for The Hunting Ground was sealed the second that Brian Wilson wasn’t nominated. With this win, Stefani Germanotta will complete one of the greatest collections of awards in the industry: Grammy, Academy Award, Golden Globe, and American Music Award. Otherwise known as the GAGA. SEAN: I think you guys should prepare yourself for a Sam Smith win. This branch is notoriously lazy in their nominees and winners. He’s the It-Kid at the moment. It’s not as bad of a song as some make it out to be, but it ain’t great either. I’d much rather see Gaga win. And mark my words, it will happen in more than one category throughout her career. CHASE: No! No handouts for The Martian! Fury Road. SEAN: I love love love love love love that Fury Road‘s insanely visionary design is going to pick up this award. 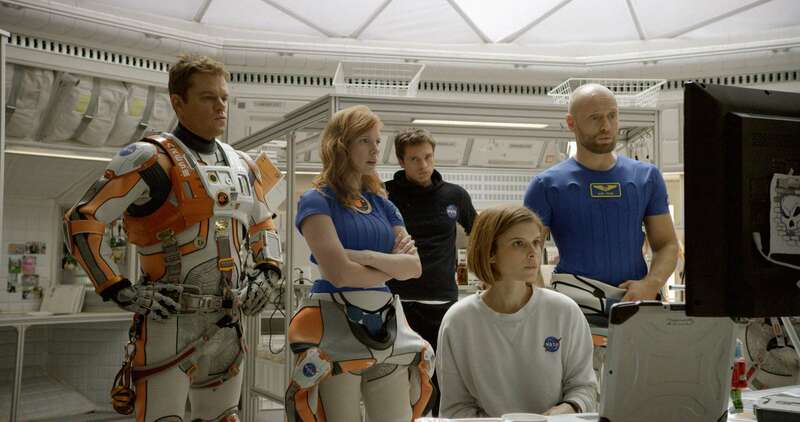 The Martian might have been my number two choice… but honestly, where the hell is Carol? CHASE: Sicario was nominated for way too few awards, and I really wish I could pick it. I’ll go Fury Road/Revenant and tip my hat to David’s “sound” logic (which will surely mean nothing when Star Wars somehow wins twice). 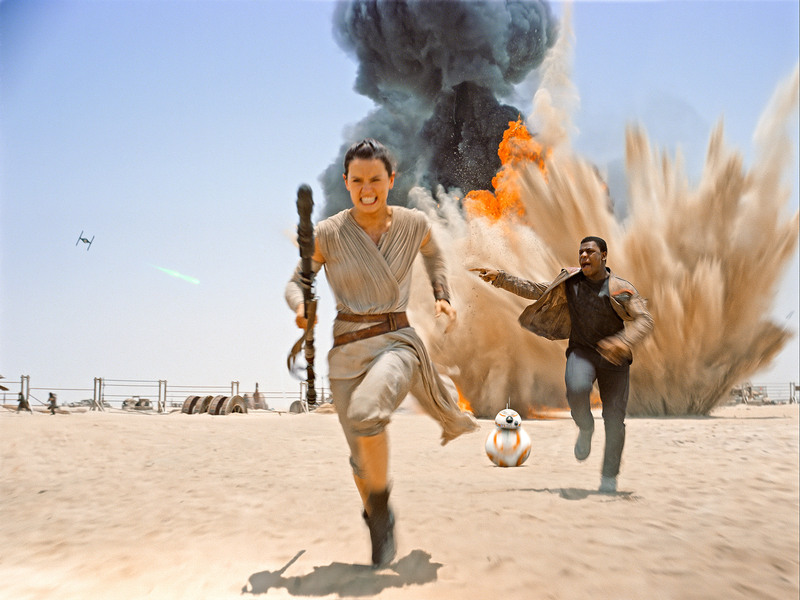 SEAN: Fury Road could well take both of these categories and it probably should, but Star Wars continues to have the best and most iconic sound in the business. Nostalgia combined with an organic soundscape will make this an easy vote for many members. DAVID: Force Awakens could easily ride a wave of nostalgia to win “Most Effects” (as voters do tend to get confused about that); at the same time, if any film could win the award on the strength of one scene, it’s The Revenant’s remarkable bear attack. But I’ve come this far — why stop now? For its jaw-dropping blend of live action (those polecats!) and CGI effects, give me Fury Road one last time. By my count, that could give it at least a half dozen wins — too good to be true? CHASE: I so badly want to pick Ex Machina here for the way it mastered androids. Fine! I’ll do it! This is my heart picking Ex Machina. Fury Road likely wins. SEAN: Fury Road really should take this, but Academy members seem averse to practical effects work in the past couple decades. No matter: Star Wars will make a worthy winner as it pulls off many of the same tricks as Fury Road, just with more fantasy spectacle. DAVID: Waaaayyy out in front here is Hungary’s Son of Saul; first-time director Laszlo Nemes picked up accolades at Cannes and beyond, and you really should know better than to bet against a Holocaust drama. France’s Mustang has its supporters, but it should be no contest. CHASE: See above. Son of Saul. SEAN: Nothing will beat Son of Saul. It’s as locked as DiCaprio. DAVID: Finally, the dart-throwing portion of our program, where Oscar pools can be won or lost. I was clever (or lucky) enough to go three-for-three last year — first time ever! — but I’m not counting on that to happen again. Still, I’ll take Body Team 12 for Documentary and Ave Maria for Live Action; for Animated, the only category where I’ve seen a couple of the nominees, give me Don Hertzfeldt’s BRILLIANT World of Tomorrow (it’s on Netflix, watch it) over Pixar’s comparatively slight Sanjay. CHASE: You think Fury Road is too out there for Oscar voters, but World of Tomorrow is going to win? Bah! Bear Story is my pick. Last Day of Freedom and Day One give the Academy an easy answer to “Oscars So White” without really having to do anything. SEAN: My shot in the dark picks – Prologue, Claude Lanzmann: Spectres of the Shoah, Stutterer. Let’s hope for a few surprises. The Academy Awards air this Sunday night on ABC! UPDATE: Chase takes the championship belt with 17 correct predictions! David and Sean tied with 15.